For the sake of introduction, we'll simplify the model of study by reducing the dimensions to one, since it all started that way. And so instead of dealing with polygon, we will first look at permutations of sequence of numbers. 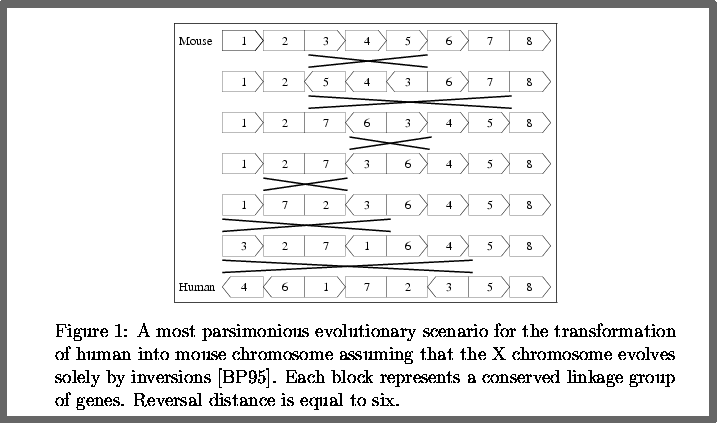 The motivation of the study of permutations arises in molecular biology and bioinformatics [3, 4, BP95, 5, 6]. One of the most dynamic field of research in science for the past decades has been the study of genomes and more precisely the human genome. Concurrent with the fast progress of the Human Genome Projects, genetic and DNA data on many model organisms were accumulating rapidly, and consequently scientists were in urgent need of techniques for comparing genomes of different species. Here's an example of how to compute the reversal distance between 2 sequences representing two gemones of different speacies.